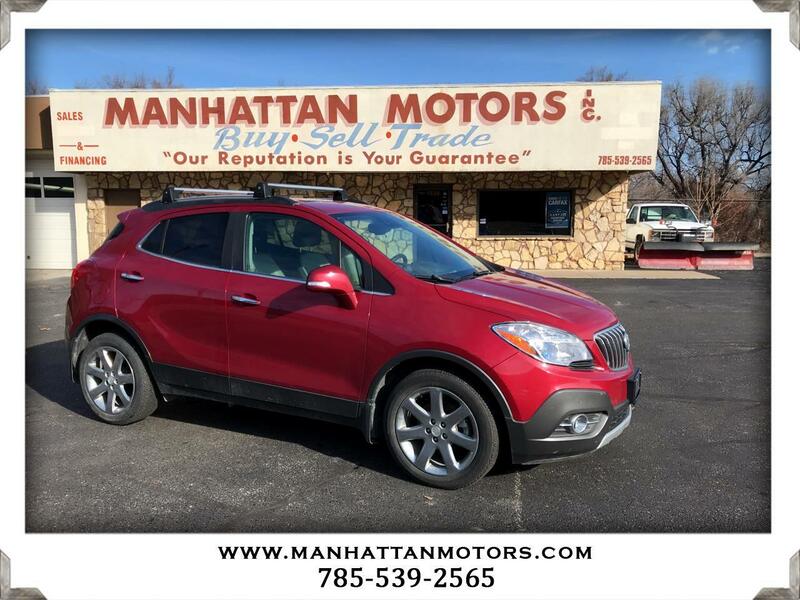 Our One Owner, Accident Free 2014 Buick Encore crossover on display in Ruby Red Metallic boasts a versatile interior, nimble handling, and innovative technology. Powered by a TurboCharged 1.4 Liter Ecotec 4 Cylinder that offers 138hp while connected to a smooth shifting 6 Speed Automatic transmission. Our Front Wheel Drive machine reaches 30mpg on the highway. You won't hear the engine, though, thanks to an active noise-cancellation system. Heated side mirrors, fog lamps, rain-sensing wipers, roof rails, rear privacy glass, a rear lip spoiler, a large sunroof, and beautifully designed painted alloy wheels accentuate the sculpted contours of our Encore. Inside are detailed designs and indulgent comforts such as heated leather front seats and a leather-wrapped steering wheel with mounted controls. Dual-zone automatic climate control, and a six-way power driver seat with memory are convenient; while split-folding rear seats and a fold-flat front passenger seat add to the flexibility. IntelliLink interface with a touchscreen, Bluetooth phone and audio connectivity, and a Bose 7-speaker sound system with available satellite radio/iPod interface allow you to stay connected and listen to whatever music suits your mood. Advanced safety features such as a rear view camera, blind spot monitoring system, parking sensors, forward collision warning, lane departure warning, and StabiliTrak traction control provide outstanding safety for everyone in the vehicle. Available OnStar also offers peace of mind with automatic crash notification, on-demand roadside assistance, and other services. A sumptuous interior plus responsive performance set Encore apart. Print this page and call us Now... We Know You Will Enjoy Your Test Drive Towards Ownership! Thanks for choosing Manhattan Motors. We recently won The Manhattan Mercury Readers' Choice Award for being the #1 Used Car Dealer. Buyers enjoy our "laid back" approach. No test drive routes or high-pressure salesmen. Our focus is to offer all of the information you need to help make the best decision for your family or business. Each one of our vehicles undergoes a 30-point vehicle inspection by Burnett Automotive, Manhattan's #1 Auto Service Facility. We are also the area's only Independent USAA Certified Dealer, offering discounts on purchases and interest rates.